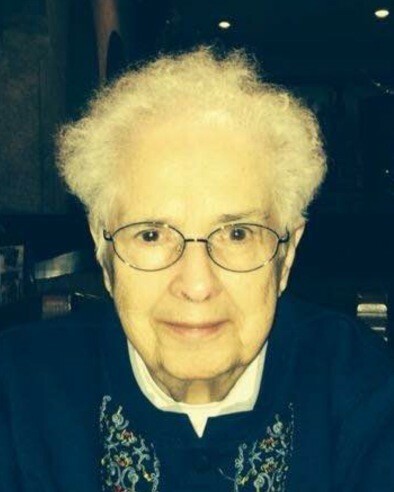 Elizabeth Marie Janson, 91, a resident at Bluebird Estates in East Longmeadow, MA and formerly of Brick, NJ, died early Saturday morning, April 6, 2019 in the comfort of her home, surrounded by her loving family. She was born in Allentown, PA and grew up in Lebanon, PA, a daughter of the late Leo and Elizabeth (McNally) Rudegeair, and earned her BS degree from Misericordia College in Scranton, PA. She began her first career as a dietician at St. Luke’s Hospital in New York, NY, and later married the love of her life, Albert Warren Janson on June 27, 1953. After raising her family in Lawrence, NY, Elizabeth returned to work where she was employed for 20 years as the Director of Home Economics at the Helen Keller National Center for the Deaf and Blind Youths and Adults in Sands Point, NY from which she retired in 1993. Besides her parents and husband, Elizabeth was predeceased by a son, James W. Janson in 1962 and her siblings, James, John and Doris Rudegeair. She is survived by three loving children, Christian L. Janson and his wife Josephine of Colonia, NJ, Jan A. Janson and his wife Trina of Virginia Beach, VA, and Melissa J. Simons and her husband Richard of East Longmeadow, MA; two brothers, Leo Rudegeair and his wife Vera of Clarksville, MD, and Edward Rudegeair and his wife Diane of Wakefield, RI; a sister, Marie Rudegeair, S.S.J. of Flourtown, PA; eight cherished grandchildren, Bridgid J. Hein and her husband Tom, Norah Elizabeth Skutnik and her husband JJ, Anders William Janson and his wife Baylee, Kurt David Janson, Jacob Michael Blachura, Dayna Karin Janson, Samuel William Simons and Madison Elizabeth Janson; three cherished great-grandchildren, Tommy Albert Hein, Grace Vera Hein and Lily Kathleen Hein; as well as several nieces, nephews, grandnieces, and grandnephews. A heartfelt thank you to all of Liz’s aids from Murphy Avis Services who allowed her to live out her days comfortably in her own home. Calling hours will be on Wednesday, April 10th from 4-7 PM at the Byron Keenan Funeral Home, 1858 Allen Street in Springfield, MA. A memorial service will follow at 7:00 PM. A private burial will take place in Long Island, NY. In lieu of flowers, contributions in her memory may be directed to the Baystate VNA & Hospice, c/o Baystate Health Foundation, 280 Chestnut St., Springfield, MA 01199 or to the American Heart Association P.O. Box 417005, Boston, MA, 02241.